If you’re one of those people who’s not gardening due to time constraints, I just found some time for you. Try “pot-in-pot” gardening. There’s nothing to it. Although developed for nursery production applications, this process is now finding favor among time-strapped home gardeners. The traditional way of planting containerized plants is to buy nursery stock and transplant it into decorative pots. Pot-in-pot involves just slipping plants, still in their nursery pots, into decorative containers. Recently, a friend used this pot-in-pot technique for flowers he traditionally places on graves of loved ones for the summer. In past years, he bought flats of flowers and transplanted them into decorative pots. This year, he bought hanging baskets the same size as the decorative containers. All he had to do was lower the hanging baskets into the decorative pots using the hangers and then remove the hangers. I tried that at home as well, except that I opted for nursery pots instead of hanging baskets. 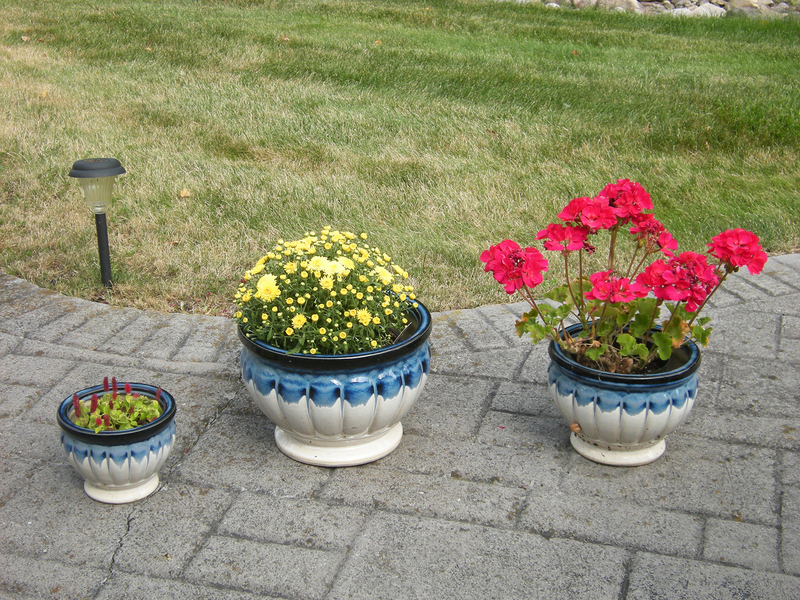 As the photo shows, I placed nursery pots of flowers into three matching, decorative containers. One had yellow marigolds, another red geraniums and the third had a small blue and white flower. That plant was near the end of life when planted, so I replaced it with chenille firetail. I’ve since changed out the marigolds, as well, replacing them with yellow mums. Plan to water these plants more often than you would plants transplanted into containers. The nursery pots are just that much smaller than the nursery pots that water has to be replenished more often. That’s in a normal year. We had enough rain in July that I only had to water once or twice. If there’s no rain for a couple of days, I check them with a moisture meter and water if necessary. At summer’s end, when these flowers need to be changed out, I’ll just pull the nursery pots out, put the plants in the compost heap and recycle the pots. Then I’ll get appropriately sized nursery pots of chrysanthemums (mums) and plant them the same way – pot-in-pot. If you want to plant annuals in the ground for quick change out, you can bury nursery pots in the planting bed right up to the rim. Then buy plants in same size nursery pots and slip them into the buried containers. When they have completed their lifecycle, just lift the inner pots out and replace them with fall flowers. I wrote in the opening paragraph that this technique was developed in the nursery industry. Nursery managers plant row after row of sapling trees using the pot-in-pot method. This way, they can just lift the trees out of their liner pots to ship to landscapers and garden stores. We in the tree and landscape business are just as time challenged as you, so I was happy to learn that home gardeners have embraced this pot-in-pot technique. ← What The Heck Is Bed-Head Gardening? I love mums and this was a great post to read through! Thanks for sharing.